Q. Where are the business and economics books located? I am looking for business, accounting, information systems, management, economics, finance, entrepreneurship, marketing, strategy, or organizational behavior books. Business and economics books are located in the compact shelves on the first floor of the library. See the screen shot below. The Harold B. Lee Library has a wide variety of business and economics books in print and electronic form. To find a book's call number, use the HBLL search feature found here. If the library has an electronic copy of the title, a link providing access will appear in the search results page. If you are off-campus, you may be required to login with your NetID and password. Online floor maps make it easy to find a book. Once you have a call number, simply go here and type the first letter or two of the call number into the search bar near the top of the page. A green thumb tack will pinpoint the location of your book. The library also subscribes to many business magazines and journals, and these can be found online or in the periodicals section on the second floor. 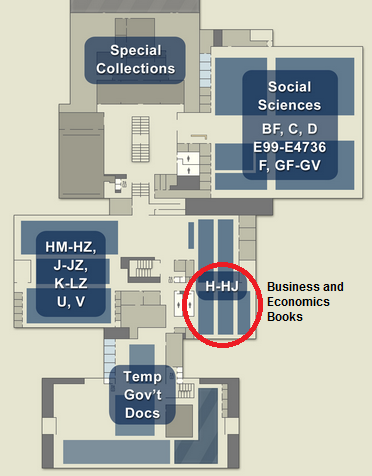 Visit the business and economics reference desk in HBLL 1210 if you need additional assistance.